If you do not have a compelling reason to be on the roads and highways over the July 4th holiday, then take our advice and stay home. That’s because drunk driving crashes traditionally increase significantly over the holiday – making it one of the deadliest times to be out and about. We’ll talk about it in this issue as well as share tips for how you can identify a drunk driver. Why are holidays such a dangerous time to be on the road? We celebrate quite a number of holidays here in the U.S., and during those celebrations, the number of drivers on roads throughout the country peak as family and friends unite to have a good time. 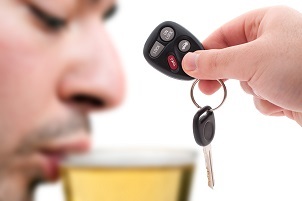 During the 2015 July 4th holiday weekend, 146 people were killed in drunk driving crashes – that’s according to the National Highway Traffic Safety Administration (NHTSA). How can I recognize a drunk driver on the road? With help from Mothers Against Drunk Driving (MADD), here are a few signs to look for as you protect yourself and your family from drunk drivers. Pull over and call 911, making sure to provide authorities with the exact location of the vehicle. As we said earlier, if you do not have to be on the roads during the July 4th holiday, your best bet may be to stay home. If, however, you’ve been injured by an impaired driver, call Barber & Associates.